I’ve baked a fair amount of bread in my time: loaves and bagels, schnecken and doughnuts, I’ve even baked my own harvest loaves, so I was fairly confident this week. The Signature Challenge was a yeast-less loaf: we questioned whether scones counted (my big old fashioned recipe book suggests they would), but everyone seemed to go for a loaf of Soda Bread – which I have also baked before, I thought that maybe I would focus on St Patrick and flavour it with snake and three leaved clovers – Guinness would probably be discounted as it contains yeast, but beer and bacon sound good to me. I have to confess to having never even attempted baking a baguette – at least not from scratch (part-baked ones have always sufficed). 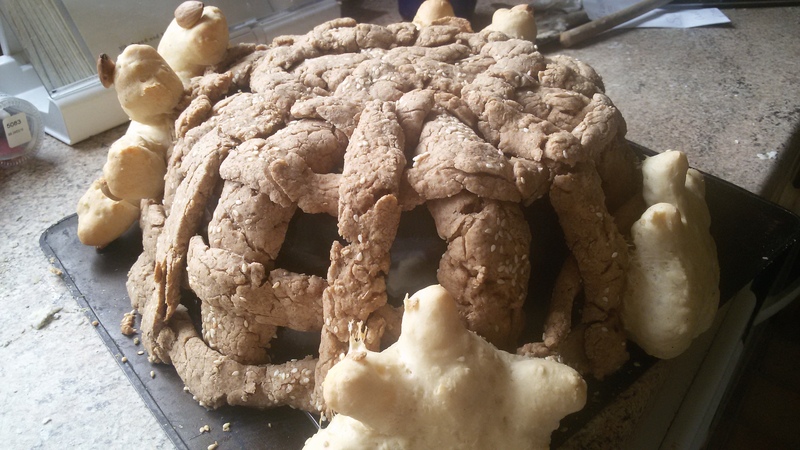 This week I have decided to focus on the Showstopper – a Statue made from Bread. Ordinary Time is a time in the church when many of the stories about Jesus being ‘the bread of life’ are celebrated and preached on. My favourite of these is the story of the feeding of the 5,00o, when Jesus took the offering of a young boy’s packed lunch and blessed it, broke it, and multiplied it, so that everyone had more than enough to eat (indeed there were 12 baskets left over!). The packed lunch consisted of 5 loaves and 2 fishes. What you can see attached to the sides are 2 pairs of hands – a small pair belonging to the child handing over his packed lunch, and the larger pair belonging to Jesus. Plain white bread for the child and white bread flavoured with oil of Cassia, which always speaks to me of Easter, reminding me as it does of the oils used to anoint Jesus’ body. I had originally thought about making a rich brioche for the hands of God, but time just slipped away… (as did the energy, having been up all night with a daughter with earache). 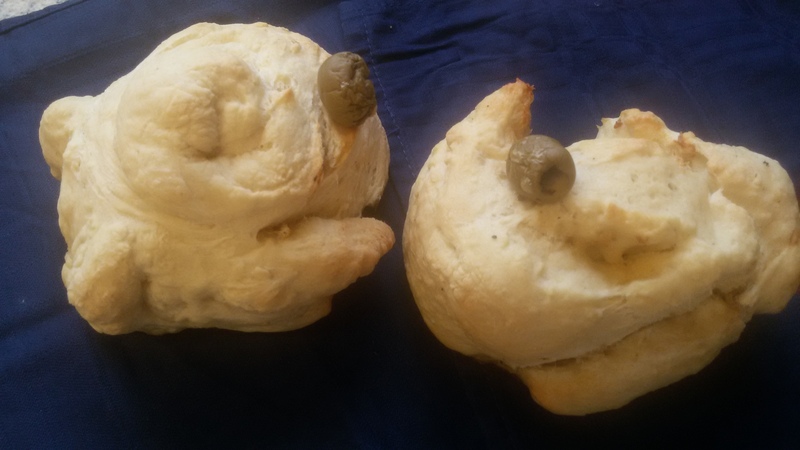 The two fish have been made with some of the white bread batch, but stuffed with a tuna, butter, olive and Tabasco mix (which uncooked tastes very nice as a pate – perfect for St Peter’s day). The shape didn’t keep terribly well, but would make a good picnic dish. The 5 loaves of bread, have been made from a flatbread recipe, with just a touch of roasted olive oil to coat them. This certainly took more than five (heavily interrupted) hours, and I still have to assemble my showstopper without letting it crumble!